A thousand years ago, Shahnameh: The Epic of the Persian Kings, was written, capturing the tragedies and joys of the human existence with its wonderful tales of love, loss, deception, adventure, heroes, and anti-heroes. The story has lived on as an undeniable classic throughout the centuries, but how many people today own a copy of the book -- or have actually read it? With the publication of Hamid Rahmanian's magnificently illustrated Shahmaneh, now is the time to bring this classic into the home. This edition is simply breathtaking: 600 illustrations dance across every page, each telling a story in a thousand intricate and beautiful artistic flourishes. Accompanied by a translation of the text that is charming, accessible, and rich in the nuances of the Persian language, it is a treasure that will be cherished and handed down to subsequent generations. Over 10,000 hours were spent on creating the illustrations for this classic tale by the great Persian poet Ferdowsi, and once can well see why. Fusing classic Persian art and modern collage-like sensibilities, Rahmanian employs cutting edge graphic design technology and incredibly rich color to create a thoroughly captivating depiction of one of the greatest epics of all time. One can find oneself immersed in each page indefinitely, exploring the intricacies and beauty of illustrations that have the detail of traditional miniature Persian art. Hamid Rahmanian has truly created a gem of a book that will delight readers and introduce them to the rich heritage of Eastern mythology. In the history of literature, Shahnameh stands next to the giants of mythological and epic tales like Gilgamesh, The Odyssey, Nibelungenlied and Ramayana. Written in the year 1010 AC by the Persian Poet Ferdowsi, it is the longest poem ever written, standing at 60,000 heroic verses. 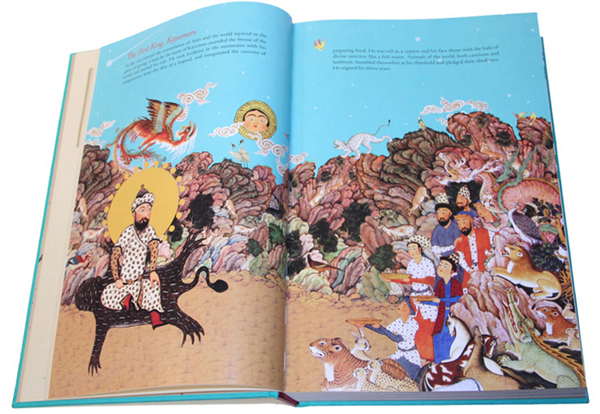 Ferdowsi collected the oral histories, traditions and fables of the region that went back thousands of years, and then wove them together into one monumental work: Shahnameh: The Epic of the Persian Kings. The epic includes four traditional tragedies and three love stories; this is the first time these stories have been introduced to the public in an accessible and modern way. Beyond the beautifully and accessibly translated text, it's the illustrations of the book that truly stand out. Capturing hundreds of years of visual history from the region, each page is a visual feast for the eyes, a labor of love that in some cases took upwards of 120 hours to create. Hamid Rahmanian, a documentary filmmaker and artist, started working on this book about four years ago. His wife and creative partner, Melissa Hibbard, and Hamid wanted to introduce the mythology of Shahnameh to a Western audience in an accessible way. They tried a few different forms, including a pop up book for children, a traveling puppet show and an iPad application and settled on the current book format when their publisher, Jim Mairs, saw the first round of illustrations and fell in love with them, not knowing anything about the stories. The couple collaborated with Professor Ahmad Sadri from Lake Forest College in Chicago. Professor Sadri translated and adapted the text. Melissa worked on the project as the editorial director. It was a dream fulfilled when The Quantuck Lane Press, a publisher known for its exquisite art books and limited editions, published the book just last month. It is available for purchase all over the country in bookstores and on their website. In an interview with Hamid Rahmanian, he explains the book's significance, its parallels to today's Iran, and the artistic and cultural significance of his illustrations and the book as a whole. What is the significance of this book coming out at such a crucial time in Iran's history? What people here in the West know about Iran is mostly headline politics. Very few people know anything else about the country. This book offers a more sophisticated look at what Iran has contributed to [in terms of] civilization and gives a broader look at its culture, art and history. What's new about this book? What does it add to our knowledge of Iran and its history and culture? In terms of the illustrations, I've taken from over 500 hundred years of the visual culture from Iran and its neighbors, The Ottoman Empire, Central Asia, and Mughal India who were influenced by Iranian painting from the late fourteenth to mid nineteenth centuries. I deconstructed hundreds of miniature paintings and lithographs then wove together thousands of these elements into new illustrations, much like a DJ samples different sounds to create new music. For those who are not familiar with Persian miniatures, it's a great introduction to the art of that region. For those who know the­ work, it's a totally new take on something familiar. Does this book give the reader any insights into today's Iran? Shahnameh has always been part of Iranian society. Opposing political parties use the stories of Shahnameh to gain popularity among the people. There is a quest for justice through out the text, which resonates strongly with the struggles of the current political environment. Even last week, a potential presidential candidate used Shahnameh as an analogy in his attempt to win the presidency. Is this version of Shahnameh a good window into Iranian culture for someone who is not very knowledgeable about it? Absolutely. Readers will be reminded of other world mythologies. There's a universal quality to the text that anyone can relate to. The stories, which go back thousands of years are fascinating. There are heated love stories, classic tragedies, a Herculean-type hero, Rostam, who leads the reader on perilous journeys. It's a classic text in that sense. But it's also the backbone of Persian culture and a wonderful introduction for someone unfamiliar with the region. It's a fun and entertaining read and the images, over 500 of them, guide the reader through the book, like a movie. Is there a historical relationship between imagery like the beautiful designs in this book and storytelling in Iranian culture? The stories of Shahnameh had been illustrated even before Ferdowsi penned his tome in the tenth century. From the high art of illumination and miniature painting to low brow coffee house paintings, artists have used these stories as inspiration for hundreds of years. Kings commissioned illustrated editions to give as gifts to other heads of states and crudely painted canvases were used as backdrops for village performers to retell the tales of Shahnameh to local audiences. For some reason, this long tradition ended about 150 years ago. Our new Shahnameh can be thought of as a revival of this practice. Are there any parallels between these old stories of tragedies and triumphs and Iran's current situation? Yes. In the storey of Kaven, the Blacksmith, this lowly artisan raised an army against the tyrannical Serpent-King, Zahhak. Many people today, use this story as a parallel to what his happening today with the current oppressive regime. What is the place of the original Shahnameh in Iranian literature and world literature? Shahnameh is very important. It single-handedly kept alive the Persian language after [Persia] was invaded by Arabs in the seventh century. Although it is 1000 years old, people can still read the text today. Most Iranians know the main stories and can recite a few lines of poetry. It's still very relevant and alive in the hearts and minds of the people. How loyal is this book to the original text and stories? What are the differences between your text and the original text? For translating the text, we worked with Professor Ahmad Sadri, to translate and retell the stories. We had a vision to create a cinematic, character-based story that someone with no knowledge of the Shahnameh could pick up and read easily. One of the biggest challenges was balancing our need to stay true to the original text and our need to make it relevant to a modern audience. We chose the first two-thirds of the Shahnameh because it had a strong narrative thread that the audience could easily follow. The characters were defined, well developed and relatable. We condensed the stories and made them move faster, edited out some of the side stories that might seem a bit too long winded for a 21st century reader and massaged every bit of emotion and nuance that we could, without changing Ferdowsi's narrative. We never implied anything or made assumptions about what Ferdowsi might have been thinking. If it wasn't in the text, we left it out. As an Iranian graphic artist, I have always loved the visuals of Shahnameh -- the miniatures, paintings and lithographs. I have wanted to do something with them for a long time but never had the right vehicle. When I started thinking about doing something with Shahnameh, it really clicked for me that this was my chance to explore this passion I had for these images. In terms of why we decided to take on Shahnameh, we wanted to take it out of the hands of the scholars and introduce it to a larger, broader audience. There is an interest in mythology here in the West, particularly, in American. If you go to a bookstore, you can find books on every mythology on earth, but for some reason, Persian mythology seems inaccessible and not represented in the pantheon of world mythologies. Also, many younger Iranian Americans know about Shahnameh but few have read it. We thought this would be a great introduction the text for second generation Iranians who have grown up here in the US, a way to connect to their roots. Do you think this book has the potential to be a movie? Absolutely. With all the movies and TV shows like Game of Thrones and Lord of the Rings, Shahnameh could definitely fit well into that niche. There are a lot of stories that would be right for genre. But if I go any further, I think I would give away my next move so I will leave it there.